Infinite Art Tournament: Saint of the Month: St. Valentine! 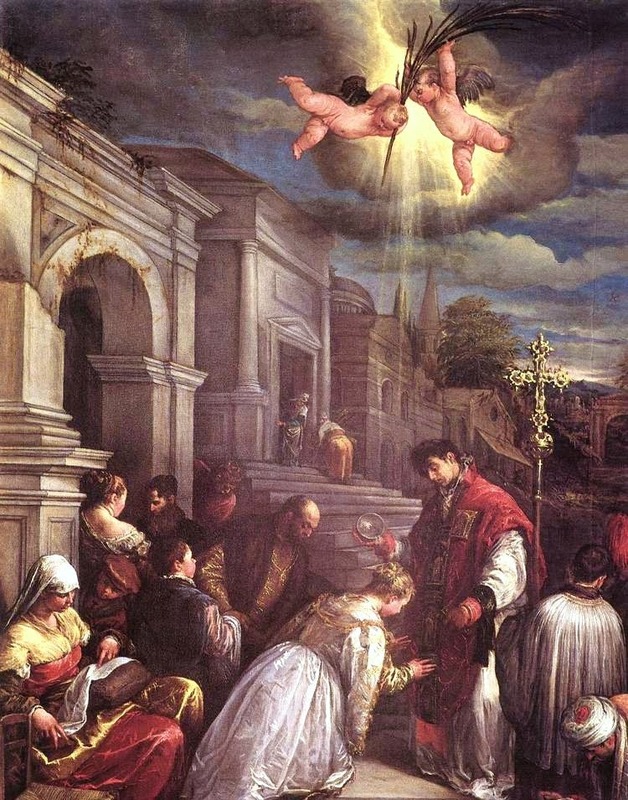 St. Valentine Baptizing St. Lucilla, by Bassano, 1575 or so. AKA: Saint Valentine of Rome; Saint Valentine of Ferni. Timeframe: late second and third centuries. Credentials: Canonized by papal decree in 496. Patron Saint of: beekeepers, engaged couples, greeting card manufacturers, happy marriages, love, lovers, young people. Symbolism: Birds, roses; shown as a bishop performing a marriage, possibly with a rooster nearby. We've all wondered about it from time to time: just who is this St. Valentine? Who is this religious figure we celebrate with pink frilly hearts, maudlin expression of amorous love, and other trappings of romantic sentiment and/or the eternal quest to get laid? He must have been quite a lady-killer! Or maybe not. The Feast of Saint Valentine was established on February 14 by Pope Gelasius I way back in 496, but even in the official declaration of the feast Glasius admitted that although there was a tradition of reverence for Valentine, nobody knew a damn thing about him. Indeed, there are two or three fragmentary, after-the-fact stories of various St. Valentines. Based on the available scholarship and, I expect, convenience, it has been more or less decided that these stories are probably based on the life of one real guy. The potentially real St. Valentine, then -- but wait. I should make clear that we are not talking about Saint Valentine of Genoa, Saint Valentine of Passau, Saint Valentine of Ravenna, or Saint Valentine of Segovia. We're talking about Saint Valentine of Rome/Saint Valentine of Terni, who are maybe the same guy. So, the potentially real St. Valentine was a priest in Rome, possibly a bishop even, in the second or third century. He was imprisoned for helping out jailed martyrs, or perhaps for performing convenience marriages that exempted men from military service. While in prison, he restored sight to the jailor's (or maybe a judge's) blind daughter. He was secretly beheaded by the oxymoronically named prefect Placid Furius on the Via Flaminia in or around 270; or, he was condemned by the Emperor Claudius to be beaten by clubs and then beheaded. If I cobble together dates from various sources, he would have been between 94 and 98 at the time, which is a pretty good run. At this time many of the noble youths and magistrates run through the city naked, for sport and laughter striking those they meet with shaggy thongs. Many women of rank purposely get in their way, and schoolchildren present their hands to be struck, believing that the pregnant will thus be helped in delivery, and the barren to pregnancy. So, yeah, you can see how that basic idea, after being extruded through Victorian sentimentality and then the American Hallmark Holiday-Industrial Complex, would translate out to more or less what we do. ...there sat a queen who was exceeding in fairness over every other creature, as the brilliant summer sun passes the stars in brightness. This noble goddess Nature was set upon a flowery hill in a verdant glade. All her halls and bowers were wrought of branches according to the art and measure of Nature. And there was not any bird that is created through procreation that was not ready in her presence to hear her and receive her judgment. For this was Saint Valentine's day, when every bird of every kind that men can imagine comes to this place to choose his mate. The royal tercel, with bowed head and humble appearance, delayed not and spoke: "As my sovereign lady, not as my spouse, I choose--and choose with will and heart and mind--the formel of so noble shape upon your hand. I am hers wholly and will serve her always. Let her do as she wishes, to let me live or die; I beseech her for mercy and grace, as my sovereign lady, or else let me die here presently. For surely I cannot live long in torment, for in my heart every vein is cut. Having regard only to my faithfulness, dear heart, have some pity upon my woe. And if I am found untrue to her, disobedient or willfully negligent, a boaster, or in time love elsewhere, I pray you this will be my doom: that I will be torn to pieces by these birds, upon that day when she should ever know me untrue to her or in my guilt unkind. And since no other loves her as well as I, though she never promised me love, she ought to be mine by her mercy; for I can fasten no other bond on her. Never for any woe shall I cease to serve her, however far she may roam. Say what you will, my words are done." Even as the fresh red rose newly blown blushes in the summer sun, so grew the color of this woman when she heard all this; she answered no word good or bad, so sorely was she abashed; until Nature said, "Daughter, fear not, be of good courage." So that's pretty hot stuff, and again, it's apparently the first extant reference to Valentine's Day as a celebration of the ol' hubba-hubba. The idea that people would read about a pretend holiday in a best-seller and decide to celebrate it in real life shouldn't sound too strange, either -- I give you "Festivus" and "Talk Like a Pirate Day" as approximate contemporary analogs -- and so this is a theory with some punch to it. On the other hand, the pre-Chaucer written record of everyday life is not amazingly robust, and it would only take some 9th Century poem about the sexiness of February 14th showing up in the archives of a Spanish convent to blow it out of the water. Medieval historians must live life racheting between dizzying fear that someone will turn up documents that undermine their entire life's work, and dizzying hope that they themselves will turn up documents that undermine everybody else's. Happy Valentine's Day, Sweety-pie. If I may call you "Sweety-pie."